It's been a long time since I've done a Tasty Tuesday post, hasn't it? I baked a lot over the weekend in preparation for a visit from some very dear friends which got me thinking about Tasty Tuesday. One of the things I made, a foolproof standby, is biscotti. This particular recipe appeals to me because you pat the dough into a 9" x 13" pan. You don't have to shape the dough into a loaf. You don't have to worry about pieces of varying length. Each and every piece is the same size. 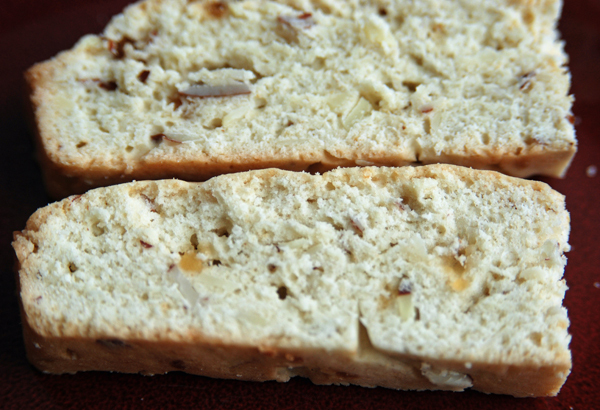 This particular recipe is for almond biscotti, but you can change up the flavor by using different mix-ins (I made some suggestions in the recipe itself.) The batch I made was ginger almond (with pieces of candied ginger and sliced almonds). Heat oven to 350° F. Grease a 13 x 9" baking pan with cooking spray. Beat in egg whites and extract on high speed, about 2 minutes or until light and fluffy. Transfer dough to prepared pan. Pat evenly into the pan. Bake 35 minutes or until a toothpick inserted in the center comes out clean. Leave oven on. Cut the finished "cookie" into 1/3s or 1/4s along the 13" side of the pan (depending on what size you'd like the biscotti). Cut each of these sections crosswise into 1/2" slices. Bake 15 minutes or until crisp and browned. Here's a look at the finished product. This is the size you'll get when you cut the large "cookie" into 1/4s. In case you're ever looking for this recipe, or any of my other Tasty Tuesday recipes for that matter, there is now a tab at the top of my home page that lists them all (with links) in alphabetical order. Also, if you try this recipe, I'd love to hear what you think of it. Take care and have a sweet day! Linking to Blooming Homestead's Crafty Tuesday Link Party, 3/19/13. this looks so yummy! i have never tried to make biscotti before!! I would love some tea and biscotti! :) That looks yummy. 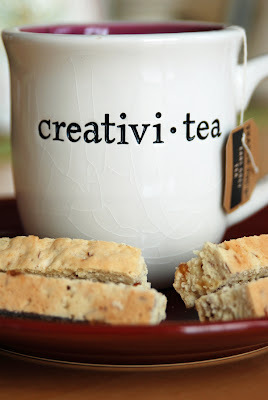 this is so cool~I have always wanted tomake this cause i love coffee and biscotti!!! Thanks Lisa!!! Yummmmmmmmmmm!! And you know the chicken crock pot one with the salsa/taco seasoning/cream of chicken etc. is now a family fave here!! we all loveeeeee it!!!! Mmmmmmmm!! I'll have to add this to my recipe collection. Is that your mug? I love it! ooooooo looks totally de-lish! Love the mug. You are so multi-talented! Tis looks good. This will be great at my next gathering for ladies coffee! Always looking for good, new recipes and I see a few there I can't wait to try. Yum!! I would love to join you, unfortunatly I am on a sugar free binge right now. We had sugar free banana nut muffins today with our coffee! This is something I have never tried making but I am thinking I should! I would be right over if I could. That looks yummy and I WANT that mug!!! Yummy! Now I just need my Carmel Macchiato to go with it! Wow, that biscotti looks so delicious! Thanks so much for linking up to Crafty Tuesday.